The December 2017–February 2018 average temperature across the global land and ocean surface was the fifth warmest since global records began in 1880. Looking at land only, the global land surface temperature was the seventh highest in the 1880–2018 record. La Niña conditions were present across the tropical Pacific Ocean during the three-month period. The globally averaged ocean surface temperature was 0.99° Fahrenheit (0.55°C) above the 20th century average. The United States was warmer and drier than normal over the winter months, resulting in low snowpack for western U.S. mountain ranges. California had its second driest winter on record. A prolonged period of warm and dry conditions combined with Santa Ana winds to fuel the largest wildfire in California’s modern recorded history. The Thomas Fire broke out in Ventura county in southern California on December 4th, and continued into the New Year. By the time it was contained on January 20th, it had burned 281,893 acres. To make matters worse, heavy rains on January 9th triggered debris flows in burn scar areas, causing flash floods that claimed 21 lives in neighboring Santa Barbara County. 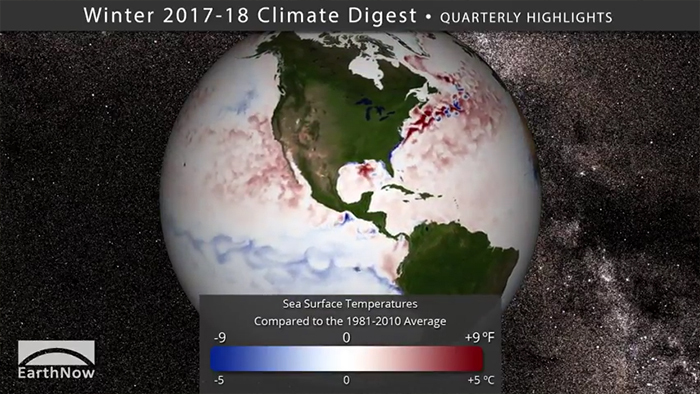 The quarterly climate digest, produced seasonally, consists of a short movie (3:20 minutes) made for Science On a Sphere® (SOS) and an MP4 video accessible through YouTube. You can download the SOS content from this FTP Site.